MANILA, Philippines – The October 2017 Certified Public Accountant (CPA) board exam results are released online on November 2, 2017 or in 10 working days after the exam. The alphabetical list of passers, A-M surname, is available on this page together with other results - top 10 (topnotchers), top performing schools and performance of schools. The Professional Regulation Commission (PRC) and the Board of Accountancy conducted the CPA board exam to more than 15,000 examinees in the cities of Manila, Baguio, Cagayan de Oro, Cebu, Davao, Iloilo, Legazpi, Lucena, Tacloban and Tuguegarao on October 7, 8, 14 and 15, 2017. The 4-day examination covered the following subjects: taxation, financial accounting and reporting, practical accounting I, auditing, auditing theory, theory of accounts, advanced financial accounting and reporting, practical accounting II, regulatory framework for business transactions and auditing problems. 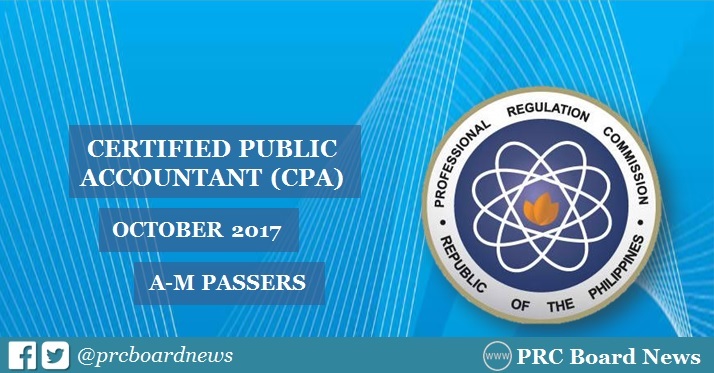 Meanwhile, the Professional Regulatory Board of Accountancy on Facebook advised: "Due to the cancellation of government office work this week which resulted in the delay of the processing of PRC work, the new release date of the results of the October 2017 CPA Examinations will be on November 2 or 3, 2017, instead of the previously announced date of October 20/21, 2017." Wonderful post,In this image, Sarah and Dom looking fantastic and modish in their ensemble. This couple gives a sweet message to the youthful couple to carry on with a glad life and students easily get try this to improve their work. I like the grin of Sarah which is great. This image demonstrates the comprehension between the couple. Amazing blog post,This is the stunning post and mind blowing work to giving the tribute to martin Luther ruler but you can get look here for best work. The job of the martin Luther lord is obvious and he generally works for the general population and he devotes his life to serving the general population. Good post,Your blog is great and I am looking precisely this data most recent couple of days. We as a whole people need to look forward and gain from the experience that we face in the earlier year but now you can click here for educational task. Your perspectives are extraordinary and you definitely watch this issue and compose on it which is extremely apparent.